single crochet 2 together. 1 single crochet into each of next 7 stitches. 1 single crochet into each stitch to end. Once you have made a few flags, you can start joining them together. Slip stitch along the top of the next flag. Continue joining the flags together in this manner. 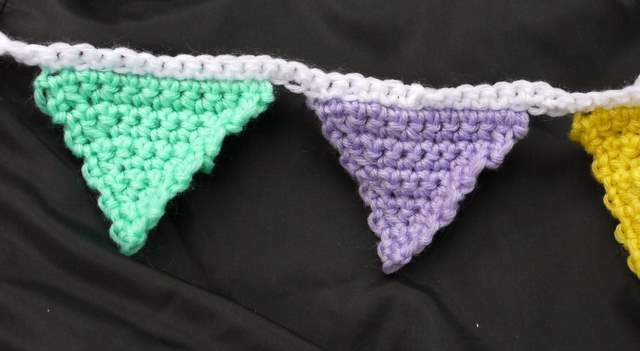 Once you have joined all the flags together that you have made so far, you can continue making more flags and then join them onto the string of flags in the same manner until your bunting is the length you want it. Make another length of chain stitches for the tie at the other end. You can either now leave it as it is, or for a neater finish, work single crochet along the chain and slip stitches.